In a study presented Dec. 7 at the San Antonio Breast Cancer Symposium, researchers conducted genomic analysis of estrogen receptor (ER)-positive metastatic breast cancer samples that had become resistant to therapies. They found multiple alterations that were not present in the primary tumor samples, with implications for next steps in treatment. An estimated 150,000 Americans are living with metastatic breast cancer, and the median survival for these patients is about three years. More than 40,000 people die from the disease each year in the United States, which accounts for 14 percent of all cancer deaths among women. 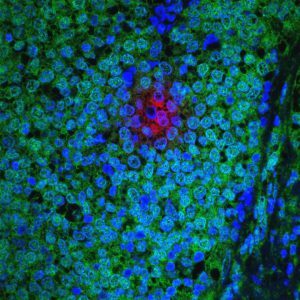 “In spite of tremendous advances in the treatment of ER-positive breast cancer using therapies directed against the estrogen receptor, patients frequently develop resistance to these therapies,” says the study’s senior investigator Nikhil Wagle, MD, a precision medicine expert at Dana-Farber Cancer Institute in Boston and the Broad Institute of MIT and Harvard in Cambridge, Mass. “These resistant tumors remain the most common cause of breast cancer death, yet mechanisms by which this resistance develops are poorly understood,” Wagle adds. Most genomic studies of breast cancer carried out until recently have used primary, treatment-naïve breast cancer samples, but cancer deaths are largely the result of metastatic and drug-resistant tumors, explains study lead author Ofir Cohen, PhD, a postdoctoral researcher and computational biologist at the Broad Institute and Dana-Farber. In contrast, their research focused on metastatic tumor samples from patients with resistant disease, he adds. “Our current research is part of a growing effort by many researchers to start closing the gap by better understanding the genomic underpinning of the metastatic and resistance states,” Cohen says. “We found that the genomic landscape of drug-resistant ER-positive metastatic breast cancer is significantly different from that of primary ER-positive breast cancer,” says Cohen. “Moreover, we were able to identify multiple clinically relevant genomic and molecular alterations in the metastatic biopsies, with implications for choice of next therapy, clinical trial eligibility, and novel drug targets. The investigators analyzed metastatic breast tumor samples from 130 patients who developed treatment resistance, along with primary tumors from 34 of these patients. They performed massively parallel sequencing, also known as next-generation sequencing, to sequence the whole exome (the genes encoding all of the proteins in the cancer cell) and transcriptome (all of the genetic messages in the cell that direct the expression of proteins) of these samples. 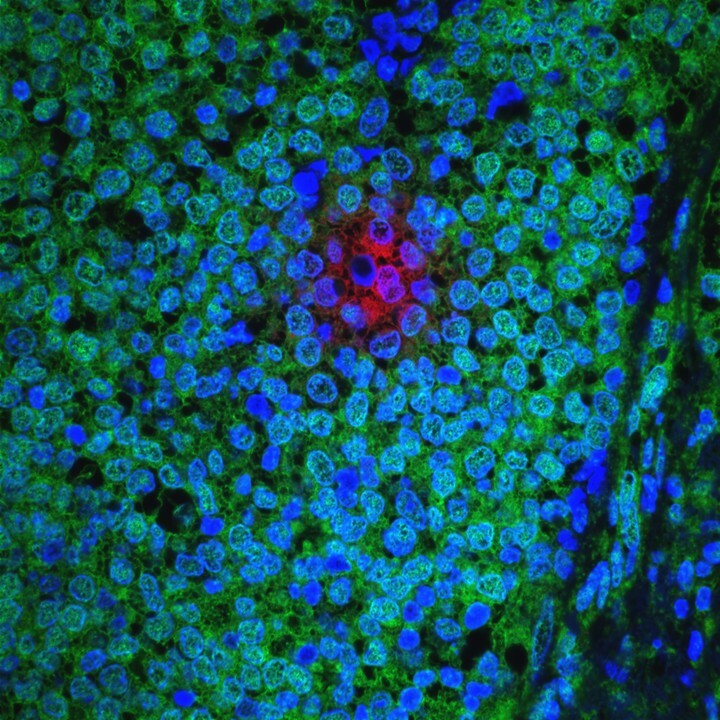 Treatment-resistant breast cancer cells. Image provided by National Cancer Institute. “With increasing numbers of patients from whom we were able to obtain and sequence the original primary tumor, we have been able to distinguish between pre-existing events [found in both the primary and the metastatic samples] and evolutionary, acquired events [found only in the metastatic sample],” says Cohen. In their study, metastatic breast cancer samples were found to have more frequent alterations in the genes ESR1, ERBB2, PIK3CA, PTEN, RB1, and AKT1, among others, based on whole exome sequencing. The information generated from this study has the potential to directly inform therapy choices for those patients, the researchers say. In some patients, they observed genomic alterations that are targets for several classes of drugs currently in clinical development. Clinically relevant results identified in these tumors have been returned to the clinicians and patients and are being used for clinical decision- making, Wagle notes. Ultimately, the goal of this collaborative effort is to integrate the functional and clinical findings into a unified “Resistance Atlas” for ER-positive metastatic breast cancer, which should help inform treatment decisions for patients and propel the development of new combination treatment strategies for ER-positive metastatic breast cancer, Wagle says. Thank you for working so diligently on this terrible disease! I’m interested in reading more about the results!